"Who are you?" the panic-stricken man articulated, with feverish emphasis. "A vampire--who wants to live as you do, love as you do. I'm your dead brother. I emerge from my tomb every night." "What would I do with it? No, it's not to draw life from the living that I emerge! The dead don't want to live." "Mercy! Have pity on your brother!" "A vampire never has pity." 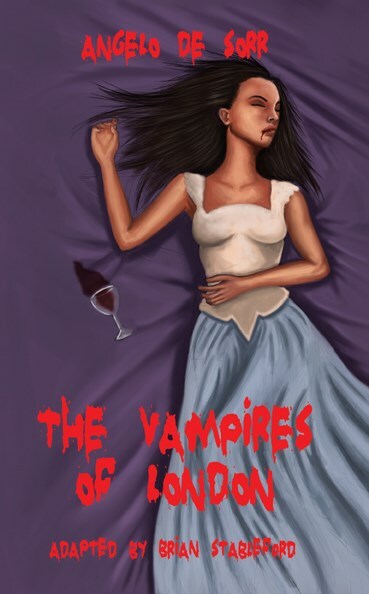 The Vampires of London (1852) is a nested series of contes cruels aggregated into a quintessentially Romantic roman frénétique, and one of the most excessive and convoluted works of that kind. Some of the scenes featuring the necrophilic vampire Lord Lodore or the one in which a young man tries to pimp his sick sister to a resurrectionist are masterpieces of the grotesque. Angelo de Sorr (1822-1881), the son of a family of vine-growers in Bordeaux, made his debut as a novelist in 1848 and eventually went on to build a substantial career, working as a writer for various periodicals and eventually publishing more than a dozen novels, as well as becoming a successful publisher himself.